Hello friend! I hope you’re having a beautiful week! Spring is finally starting to show her face, a little bit anyway, out East and with that extra sunshine can come a desire to spend less time in the kitchen. One of the easiest way to set yourself up for streamlined success when cooking is to build a pantry stocked with healthy ingredients that ensures you always have the tools necessary on hand to whip together a fabulously delicious and nutritious meal. Let’s get to it shall we? It can definitely be hugely overwhelming to clear our your cupboards and rebuild a pantry that promotes health as opposed to disease, but congratulations on taking the plunge! Once you’ve cleared out some space for some healthy goodies, I’ve compiled a list of my pantry basics to help you replenish your cupboards. Some of them I keep on rotation, such as the various nuts and seeds and their butter counterparts, and some I always have on hand, such as a fully stocked spice cabinet and all my healthy fats & oils. This may look like a huge list, but a pantry is something that can be slowly built over time, rather than purchased in one giant and incredibly expensive shopping trip. Most of these items will last quite a while and can turn your most basic ingredients into gourmet cooking in no time flat! You can start by investing in your healthy cooking oils, herbs, and spices then slowly keep growing from there focusing on the foods you will use most. So without further ado, let’s take a look in my pantry! Coconut Oil: Costco has a couple great organic brands that can cost less than half as much as the same amount of any organic brand I’ve seen in a health food store. It’s worth the membership for coconut oil alone! Butter/Ghee: Look for organic or grassfed to avoid toxins from inhumanely raised animals. Gelatin: This is a wonderfully healing food for the joints and digestive tract! Make sure you buy gelatin from healthy sources. I like Organika and Great Lakes. You can also buy hydrolyzed collagen that will dissolve into liquids. Unpasteurized Apple Cider Vinegar: Bragg’s or Filsinger’s are two great companies who keep the mother in the bottle. I prefer Bragg’s because it comes in a glass jar. Organic Naturally Brewed Tamari: always look for gluten-free! Organic Fish Sauce: Adds a zing to soups and curries!! Coconut Milk: Why mess with perfection? I don’t use any other nut milks but if you want to you can try making some cashew, almond, or hemp milk. Raw Honey: For sweetening tea or lattes. I typically try not to cook with honey or heat it to high temperatures as this can destroy the beneficial enzymes in the product. I have dried versions of these legumes as well as a couple emergency cans just in case I’m feeling rushed or lazy and want something on the table, fast. 100% Organic Bakers Chocolate: I use Camino’s, a sweet Canadian company whose baking chocolate has no sweeteners or fillers. Just cocoa and fat! Rice Paper Wraps: For when I want to eat a bunch of veggies, but am just not feeling a salad. Rice Vermicelli: For the occasional pasta craving. Homemade Vinaigrette: I always try to have one jar of homemade dressing in my fridge to jazz up a salad or wrap. Try my Lemon Poppyseed Dressing to get you started! So there it is friend! My pantry in all of its glory. Remember, don’t get overwhelmed thinking you have to have a completely stocked pantry right.now. Take some time to figure out what you like and what you’ll use and go from there. 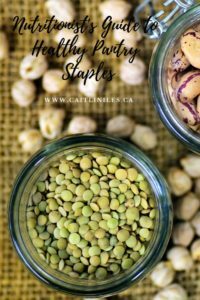 Once you’ve figured out your staples you can also start buying in bulk, which will make eating healthy, whole foods even cheaper! And if you’re looking to start the new season feeling fab and inspired then make sure you download my FREE 7-Day Healthy Detox Meal Plan right here!